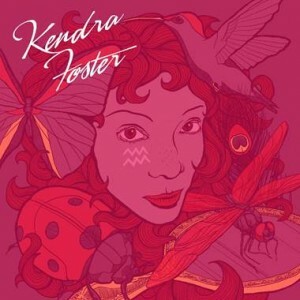 On the heels of two GRAMMY® wins for her work on D’Angelo and The Vanguard’s 2014 Black Messiah album, acclaimed singer/songwriter and member of George Clinton’s Parliament Funkadelic Kendra Foster released her new self-titled solo album last week via EarKandy Music. The album’s lead single “Promise to Stay Here” is a retro-soul gem, which features a classic R&B groove and Kendra’s velvety vocals over a funky undercurrent. It was produced by Kelvin Wooten (Mary J. Blige, Macy Gray, TLC). Whether it be a love song or a socially conscious one, Kendra gracefully brings together her rich personal experiences with a multidimensional soul-based fusion of jazz, funk, hip-hop, rock, classical, world, electronica and gospel resulting in an irresistibly layered sound full of heart, authenticity and music ministry. Strong messages of heartbreak and injustice are coated with sweet melodies of hope and triumph. Kendra has written for the likes of Mark Ronson, Sunshine Anderson &, PFunk Allstars, but it was her contributions to D’Angelo’s highly anticipated Black Messiah album that had heads turning last year, not only for her illustrious singing on the record as part of The Vanguard but for her brilliant co-writing on eight of the album’s tracks. Her work with D’Angelo won her two Grammys for Best R&B Album & Best R&B Song (“Really Love”). 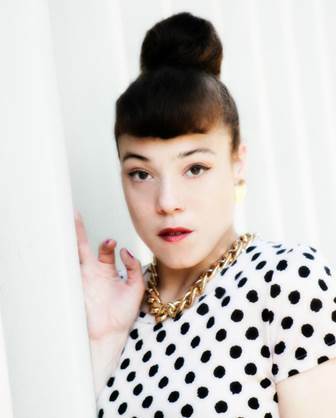 She also recently opened for Grammy-nominated artist Andra Day. Thanks for your time today! How’s 2016 been treating you and your music so far? What were some of the highlights of 2015 for you? Thank You! 2016 Has been amazing and surreal so far-MY WORD! I won 2 Grammys- R&B Song Of The Year and R&B Album of The Year, Whoa! Aaand I have just released my Solo Single “Promise to Stay Here”, doing solo shows, opened for Andra Day (who is beautiful), promoting my album which is coming later this month–extremely exciting! I’ve been working on the video for “Promise to Stay Here” which is coming in a couple weeks. Also, I am writing with many people on a variety of projects currently. 2015 highlights: Performing and making a statement about injustice on SNL with D’Angelo & The Vanguard. First Tour of the U.S. with D’Angelo & The Vanguard off the album, after many tours over seas. Being nominated for 3 Grammy categories for Black Messiah and the joy of preparing for my recent solo single release. Growing up, did you always want to be a musician? Can you recall your earliest musical memory? Was your family always supportive of this ambition? Let’s talk about your newest single, “Promise to Stay Here.” Where did the inspiration for this song come from? Sonically, it was inspired utterly by Chaka circa Rufus with a splash of Prince:) Content wise it was inspired by the love I felt at the time when I was writing the song. I was deeply in love, and in a long distance relationship on top of touring 85% of the year. I felt that love you feel when you believe someone is the one. I found myself promising I would stay and offering the best of me to insure that my loved one would stay. The deep love that makes one ask their precious love to stay in love forever. How do you think you have grown as an artist over the years? What has stayed the same? I feel that I have grown as an artist over the years, thankfully. There are many toils and snares in life and this industry and with wielding expression, but I have managed to grow in my craft and balance of life and perspective in art and industry, and maintaining regimens that support healthfully doing that. What has stayed the same for me is the raw passion and need to follow my intuition, my spirit. The unpredictable lightning bolts that shoot through me when I’m channeling this art. Can you talk about your work with D’Angelo on his “Black Messiah” album? What do you think you learned from that experience? It was a dream come true squared. I have always wanted to write with D’Angelo. There was so much genius involved in this album, and the folk involved are gems to the music world. I started writing with D around 2009/10 and initially because of our schedules, it was submission and approval style initially. Some songs that are now on the album already existed and I would fill in the blanks lyrically, melodically, singing on voicemails, sending my garage band takes. By the way, D is a brilliant lyricist himself. Once we began, fresh songs popped off the press inspired by stuff we talked about and/or from D, Quest, & Pino’s famous jam sessions that yield and have yielded the tracks for amazing classic songs. He gave me wonderful notes, much creative freedom, and space to write–letting me get first approach at those beautiful tracks straight away. Then, D and I wrote together in the studio more. It was a joy to write with him. Working, writing, performing with D taught me to be patient with perfection. Let all the perfect come out that can, and when you run out, don’t cinch up a masterpiece with an o.k. word, or an o.k. line, or an o.k. chord, or pass,etc. Wait till you find the ONE. And it reinforced my knowledge to follow my spirit or intuition. I was reminded to perform with purity and without pretension. Working on this album, with the exception for writing for a male singer, I was able to just write like I write. Like I write for me. I didn’t have to dumb down, he was very supportive. I feel love for this album like I do for my solo project because I created music I really enjoy creating so much and was able to write about what I like to write about; say profound things and write about social injustice and issues as well as create timeless love songs. Because D’Angelo as an icon was fearless enough to be cause driven and use his voice to make statements about injustice, I was able to write about injustice and imbalance that effects and has been an ordeal for my community for a long time and humanity at large. I was able to write in a revolutionary way, and not confined to limited vocabulary or hyper simplicity when it wasn’t necessary. What do you think you learned from being on Parliament Funkadelic? What was that time like for you? My time with Parliament Funkadelic was like a mystical adventure of Dorothy or Alice. I went on a splendid journey with magic, sights, sounds, and taste; with superhero friends along the way that became my family and guardians for my life path. I learned to be unafraid to be my full multidimensional self. To be open to radiate with purity and without pretension. To take risks. I learned how to vibrate amongst many intense frequencies of spirit and personality. I learned discipline, tenacity, diligence, and work ethic. I was well trained in the trenches of recording by George Clinton and Parliament/Funkadelic. Recording vocals is a performance skill in and of itself, different from stage and takes getting used to. Thanks to George and the P, I recorded all the time in many types of studios all over the world. I learned to “character sing”, and create many voices of my own through various stylizing beyond what I already knew. I got to absorb the aura and genius of demi gods worthy of their legendary status cause they are blessed with excellent gifts and they are magical. What was it like working with Kevin Wooten? Wooten is a secret weapon hidden in plain sight. Like an artistic ninja. Wooten is a genius. He is extremely, impressively technically skilled in many instruments–dare I say virtuoso– and engineering software, yes, he does it all! But his ear, imagination, tastefulness, and spirit that radiates through his beautiful gifts are transcendental and make him essential to my musical life. Wooten and I have been creating music for a long time and we have this crazy sonic chemistry. We work like mad scientist in rapid fire mode, on serious conduit status, channeling the music that zaps us. If you added up the few times we’ve been able to schedule studio sessions, we created 22 songs in a month in a half. Working with Wooten is joyful because his musical taste is eclectic like mine and he has such a wide vocabulary of sound, we can go to any “world” sonically, and make a plethora of types of music. We usually create from scratch– he plays some chords or I sing a melody and we build up from there. Every once in a while he’ll give me a track. I consider him my musical liver and kidneys. Who are some of your favorite artists? What musicians continue to inspire you through the years? Who would you love to work with in the future? Some of my favorite artists who continue to inspire me through the years are Stevie Wonder, Prince, George Clinton & Parliament/Funkadelic, D’Angelo, Belita Woods, Wayne Shorter, Chaka Khan, Bjork, Radiohead, Steely Dan, Lauryn Hill, Erykah Badu to name a few. Newer artists I’ve been digging on and think are awesome are Flying Lotus, Thundercat, Kendrick Lamar. Would love to work with all of them in the future and also many of the aforementioned favorite artists. I consider my music a multidimensional ministry. Music that speaks to all aspects of life. Love, courage, fears and conquering them, sadness, anger, frustration, encouragement, triumph, revolution, reflection, self cultivation or coping, meditation, celebration, fun. I try not to be preachy but if it sounds that way, chances are it was a conversation I was having with myself that I figured I’d share because it might be universal, someone else feeling that way. I like to make music to dance to, to be reflective to, to chill, to make love to, to wild out and feel free to, to speak out, to have fun to, get married to, cry to, to work to, to celebrate to. Music that reflects universal life experiences on earth in this dimension and attempts to ascend and transcend.